1 of 3 Heat oven to 350 degrees F. Spray a 12-cup casserole dish with nonstick cooking spray. 2 of 3 In a large mixing bowl, whisk eggs. Add soup, mayonnaise and onion, and whisk together. 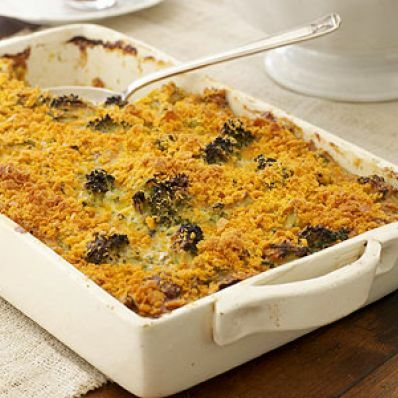 Fold in broccoli, cheese and 1/2 cup of the crushed crackers. Spoon into prepared casserole dish. Top with remaining 1 cup crushed crackers. 3 of 3 Bake at 350 degrees F for 1 hour, then open oven and check casserole-when shaken, all but the center should be set. If needed, cook another 5 minutes. Let stand 10 minutes before serving. Per Serving: 3 g fiber, 745 mg sodium, 5 g sat. fat, 76 mg chol., 15 g Fat, total, 17 g carb., 9 g pro., 231 kcal cal.